The Eastern Hellbender is the largest salamander in North America. HARRISBURG, Pa. – A bill drafted by high school students that would designate the Eastern hellbender as Pennsylvania’s state amphibian has been approved by the state Senate. The hellbender is the largest salamander in North America and it needs cold, clear, swift-running water to survive. 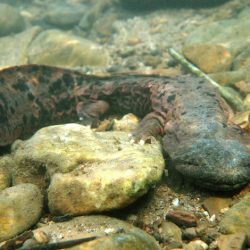 But development along rivers and streams has degraded the hellbender’s habitat and sharply reduced its numbers. Emily Thorpe, who coordinates the Chesapeake Bay Foundation’s Student Leadership Council, says the bill would do more than recognize a distinctive species native to Pennsylvania.”It’s really about highlighting the importance of preserving and protecting clean water in the state of Pennsylvania – for not only hellbenders, but all the other creatures that rely on it as well,” she explains. Senate Bill 658 passed in the state Senate on Wednesday and now will be taken up by the House.Hellbenders absorb oxygen from the water through their skin. But Thorpe points out that the removal of streamside trees has increased the amount of sediment washing into waterways – which compromises the habitat for hellbenders.”Sedimentation has really made it difficult for hellbenders to reproduce in our streams, and it’s limited the amount of large nesting rocks that they can use for reproduction,” she says. She says trees also provide shade that helps keep the water cool.Thorpe adds that the students studied hellbenders extensively, and wrote the first draft of the bill designating it as the official state amphibian.”It’s a great opportunity to not only highlight the importance of clean water in Pennsylvania, but also the ability for students to have a voice in our Legislature and to enact real change in their communities,” she adds.